The Houston Texans are on a tremendous run, winning five consecutive games away from home including a 29-22 victory at the New York Jets this past Saturday, while they’ve won 10 of their previous 11 encounters overall, covering the spread seven times during that span. DeAndre Hopkins had a big game against the Jets with 10 receptions for 170 yards and a couple of touchdowns, while the kicker Ka’imi Fairbairn hit all his five field goals including two shots in the fourth quarter. The Texans’ defense allowed 318 total yards to the Jets along with 21 1st downs, while Houston converted just one of its nine 3rd downs. Deshaun Watson has thrown for 3592 yards,24 touchdowns, and nine interceptions so far, completing 67.7% of his passes. Watson added 78 carries for 436 yards and a pair of touchdowns, continuing to toe the ball on a regular basis. Lamar Miller is leading the backfield with1080 yards from scrimmage and five touchdowns, while DeAndre Hopkins has 94catches for 1321 yards and 11 touchdowns. The Texans are scoring 25.1 points(11th in the league) on 363.5 total yards per game (14th), and their ground game is producing 130.4 yards per contest (6th). Onthe other side, the Texans are allowing 20.1 points (5th) on 346.6total yards per game (14th), and their rush defense is 4th-bestin the league with 88.3 yards allowed per contest. Is Nick Foles Phila’s rescuer? 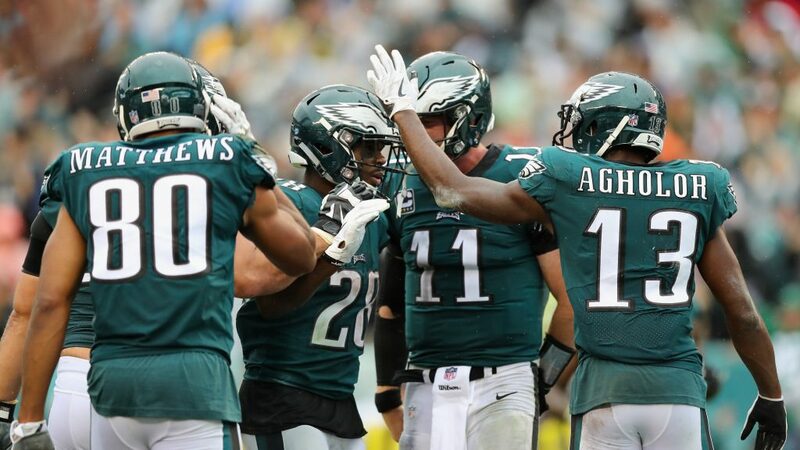 The Philadelphia Eagles have been written off after Carson Wentz suffered a back injury, but the reigning champions put on a strong performance at the Los Angeles Rams last Sunday to earn a 30-23victory as massive 13.5-point underdogs. Nick Foles had to step up once again, throwing for 270 yards and an interception while completing 77.4% of his passes, while Alshon Jeffery had eight catches for 160 yards. Wendell Smallwood had 10 carries for 48 yards and two touchdowns, and Josh Adams added 15 totes for 28 yards and a touchdown. Phila’s defense had a great night in LA, forcingthree turnovers and allowing the Rams to score just twice of their six attemptsin the red zone. In his three starts this season, Nick Foles has thrown for 721 yards, a touchdown, and two interceptions, completing 69.0%of his passes. Zach Ertz has recorded 101 receptions for 1038 yards and six touchdowns, while Alshon Jeffery has added 57 catches for 702 yards and five touchdowns.Wendell Smallwood is leading the backfield with 490 yards from scrimmage andfive touchdowns, whilst Jos Adams has 465 yards from scrimmage and threescores. The Eagles are tallying 22.2 points (18th in the league) on354.7 total yards per game (17th), allowing 22.7 points in a return(16th) on 386.1 total yards per contest (27th). The Philadelphia Eagles have no choice but to win this game and stay in the NFC playoff picture. They will have to rely on Nick Foles who will try to replicate his performance from the previous season, but the Eagles’ defense will be a key factor in their eventual drive to the success. Phila has been struggling on the defensive end for the most of the season, and they need to bring their best game to the Texans if they want to stay alive. On the other side, Houston will try to continue with great displays on both sides off the ball, as the Texans are making the 5th-fewest turnovers in the league, while their defense is doing a great job all season long. However, with their back against the wall, I’m backing the Eagles to make another upset here. As I’ve already mentioned, the Eagles’ defense will have to force some turnovers here if they want to win the clash. Likewise, I expect to see a lot of ground game on both sides of the field which will eat the clock, so I think we shouldn’t see a bunch of points on this one. With so much at stake, we could easily see some nervous play from both teams, so I’m backing the under.